Need information? Look no further. From history to health and languages to law, we have more than 50 different databases offering free, reliable, current information. Please note, some databases require your library card and PIN to access outside the Library. Explore all databases. Columbus Dispatch in full image from August 19, 2017 to current, or full text from 1985 to current. Blog and web-edition articles also available. Email, print, download, or cite articles easily. THE DAYTON ROOM at the Main Library, houses more than 200 years of historical materials about Dayton, Montgomery County and the Miami Valley area. The Collection includes books, photographs, pamphlets, magazines, newspapers, maps, manuscripts, postcards, videos and more. Many of our historic images can also be found in Dayton Remembers, our online digital image database. 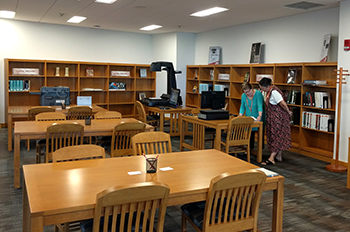 Flatbed and cradle scanners in The Dayton Room are available to help you digitize your own family documents, photos and history. The Dayton Room is located on the 2nd Floor of the Main Library. The Dayton Metro Library (DML) has been a federal depository institution since 1909. The government information collection at the Dayton Metro Library offers a core collection and specialized government documents including the US Government Manual, Federal Register, CIA World Fact Book, Public Papers of the Presidents of the United States, census information, and more. The Dayton Metro Library selects materials in both electronic and paper format. Federal depository resources are available and usable for all library customers regardless of library affiliation, disability, age, residency, or other customer status. Any member of the general public may use depository resources in all formats at a Federal depository library free of charge and without impediments.